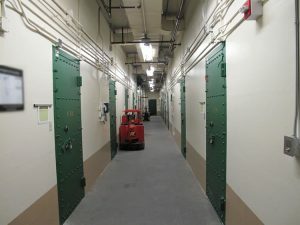 Take a few seconds… picture a labyrinth of underground vaults filled with silver, copper and other precious things… That’s what I saw under the United States Mint at San Francisco. Secured by a door that’d give pause to the Incredible Hulk’s might, I beheld the man cave of all man caves. "A man cave, sometimes a manland, mantuary or manspace, is a male sanctuary, such as a specially equipped garage, spare bedroom, media room, den, or basement," Wikipedia describes. There were vaults within the vault, behind that massive door. It’s somewhat challenging to describe this part of my private tour at the San Francisco Mint. My mind fogged walking the hallways and peaking inside the many vaulted rooms. They seemed endless. But there is one unforgettable moment that I will try to relay. Given the scope of area I first toured through that big door, I was surprised to learn that I wasn’t standing on the only level. A hoard of vaults within one big one, but there are more below? You gotta love that. Please take a moment to click on the photo and enlarge it. The thumbnail above really doesn’t express the reality of it all. Try to count the number of vault doors in that one hallway alone. Officially, these floors and vaults are where U.S. Treasury and U.S. Mint assets are stored and secured. Naturally for the San Francisco Mint, some of these assets include the various coin blanks it uses, like those to produce the proof coins in the just released 2013 Proof Set or the bullion blanks for the American Silver Eagles. 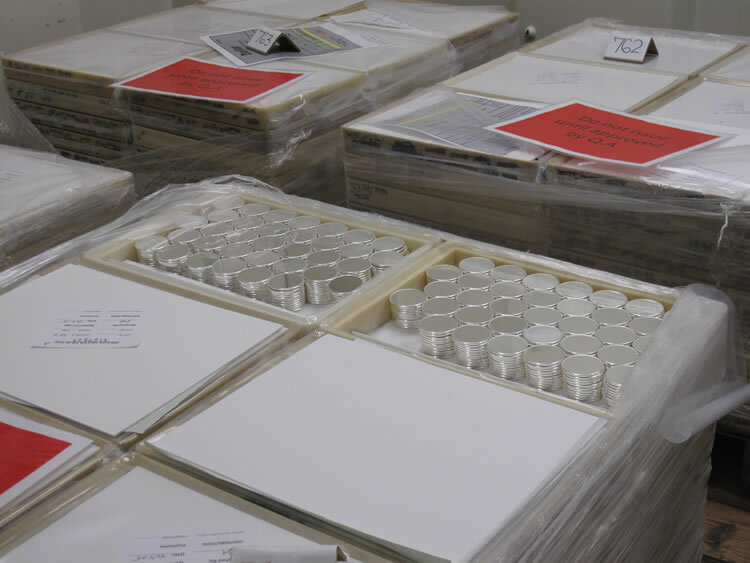 The following photo shows coin blanks for bullion American Silver Eagles. If you notice, these blanks already have their rims. They came that way from outside vendors. 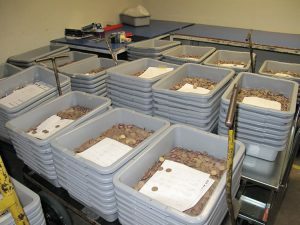 Most rims for proof coins produced at the San Francisco Mint are created in-house after they go through the annealing process (described in the next article). 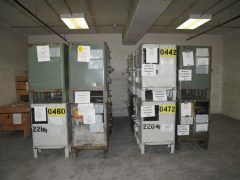 The vaults also hold finished product. 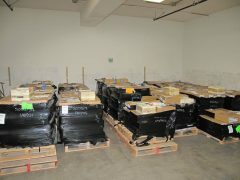 In that dense fog I mentioned earlier, I saw but failed to take photos of countless American Silver Eagles stored and sealed in monster boxes. 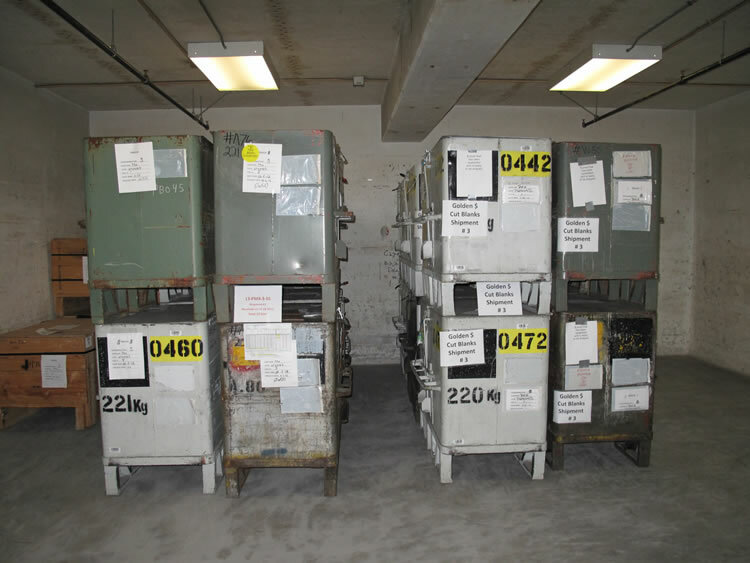 In addition to pallets (left), large metal bins (right) are used to transport blanks and coins. This short tale now comes to a close. Please join me for the next ones. Return Wednesday, April 3, for the next article in a several part series that describes my visit to the U.S. Mint at San Francisco. 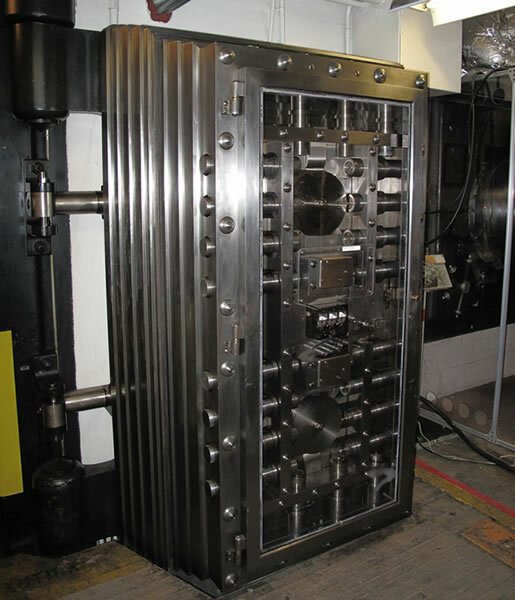 That article begins an illustrative journey of the SF Mint’s day-to-day activities. 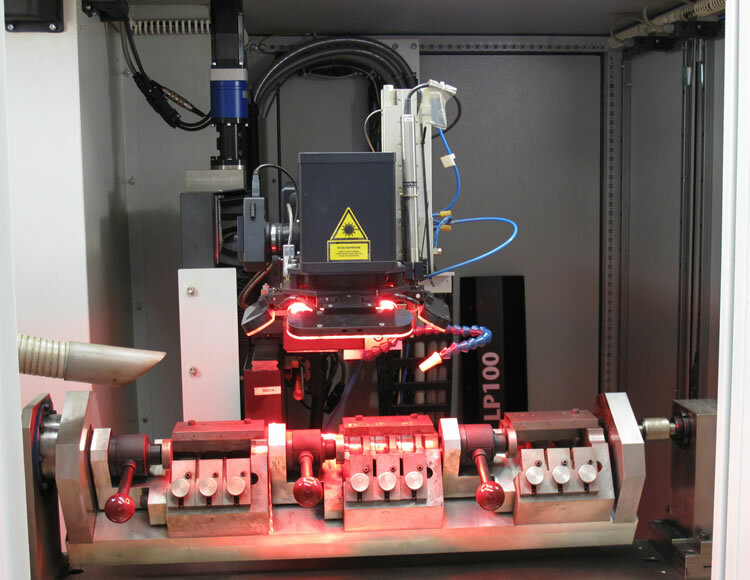 It features many walkthrough photos of preparing blanks for proof coins, including their trip through: the annealing furnace for softening, upsetting mill to place rim effects and burnishing station for polishing. Do you know what this machine does? Learn all about it in one of the upcoming SF Mint articles. Great article it only makes me want to visit. I recently found out as a Master Club Member of The Royal Canadian Mint I am entitled to a guided visit to that mint. The next time I go home to Michigan I think I’ll arrange that activity of “Mancavedom”! Great! Cool tour, and not the ordinary one the hoi polloi sees, to be sure. 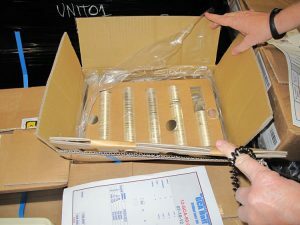 Looking forward to the one about preparation of blanks, and wondering if they showed you anything about hub and die manufacture. Mike Unser – what happen to your article today.